COMMERCE TOWNSHIP, Mich. (WXYZ) — Sending care packages to troops overseas is a way of giving our heroes a taste of home. 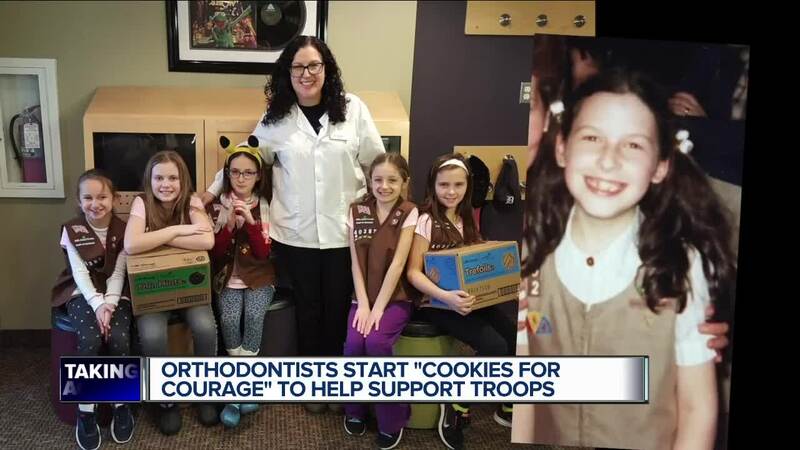 An orthodontics office in Commerce Township is taking it a step further with their generosity by supporting local Girl Scouts. The two orthodontists decided to send the cookies to troops overseas, calling it Cookies for Courage. Dr. Shapiro agrees since she is a former Girl Scout herself. The two posted on their Facebook page if any Girl Scout troops of five or more girls visit the office, they will buy two cases of cookies. As word got out, cases and cases stacked up. They have started sending hundreds of boxes, but will continue collecting cookies until late next week. It might sound silly that two people who care deeply about teeth are sending troops sugary treats, but they have this advice. “We do recommend, definitely, brushing after you have some cookies, especially the Thin Mints that really get stuck in there,” Dr. Shapiro added.